Those are just a few of the interesting projects I came across in the last week. There’s also a nice long list of Arduino user projects in the Playground, and I’ve started to collect Arduino links. Where can you get one? Adafruit Industries is one place, Maker Shed is another, and SparkFun is another. (See the SparkFun Buying Guide.) 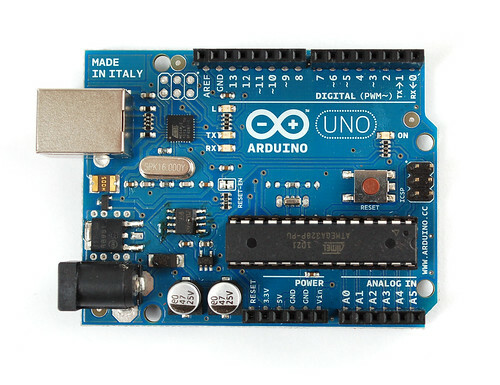 If you’re just getting started, I’d recommend the Arduino Uno (which was just released in fall 2010.) Since the Arduino is “open source” hardware, there are also clones you can buy, and each has strengths and weaknesses… but if you just want to start playing, get the Arduino Uno. Right now I’m just working through a lot of tutorials, writing test code, having a bit of fun, and thinking up some interesting project ideas… How about you? Posted on Friday, October 29th, 2010 at 11:30 am. Subscribe to the comments feed. Both comments and pings are currently closed. Post on your own blog.